Every SINGLE time I pop over to Pinterest, I find this GORGEOUS GOODNESS of a wedding cake by the amazingly talented Erica Obrien! I finally emailed her to ask permission to share this lovely with YOU. She said YES! I am over the moon thrilled to present it to you. 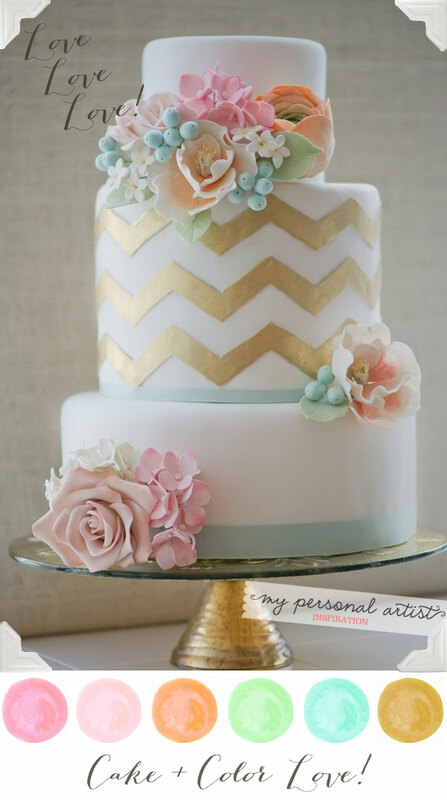 Erica Obrien’s cake design boasts my MOST favorite pastel and elegant metallic gold colors. I have to say, this is THE most lovely cake I have set my artistic eyes on. Simply beautiful. The color palette is AMAZING and I would HIGHLY recommend these colors for a wedding ANY time of year! So much cheer and so much fun. This color combination is just fabulous! 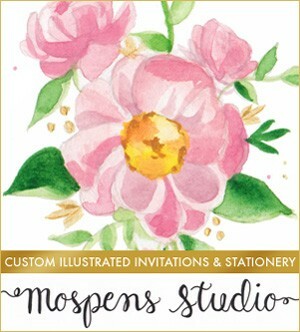 Today a client asked that I design a luggage tag for her save the date cards. I found these OLD photos, dusted them off and posted here to view. I created these TREND-SETTING luggage tag cards almost 10 years ago. Still so cute. And oh-so-versatile! 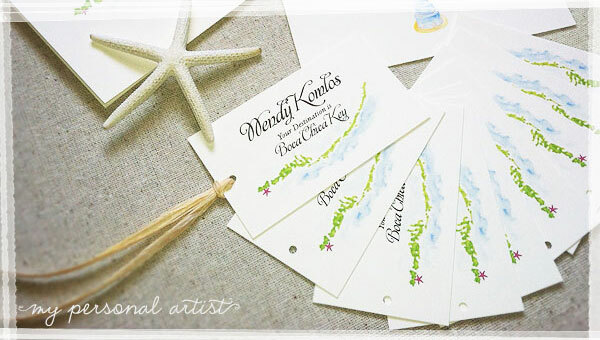 Our luggage tag card designs are perfect for save the dates, place cards, actual luggage tags, welcome guest bags, and favor tags! You can customize the size, fonts, ink colors, and art/motifs to fit your style. Imagine a larger invite card in the shape of a luggage tag. The “luggage tag design” options are truly endless! 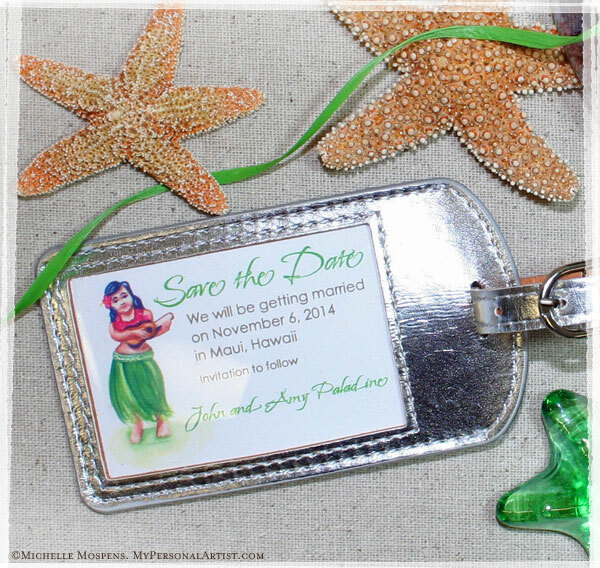 The adorable hula girl save the date luggage tags are super easy to create yourself. 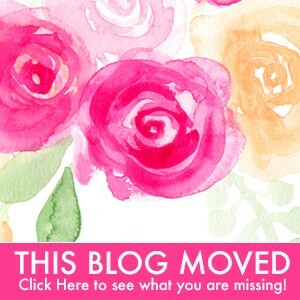 I show you how on The Knotty Bride! 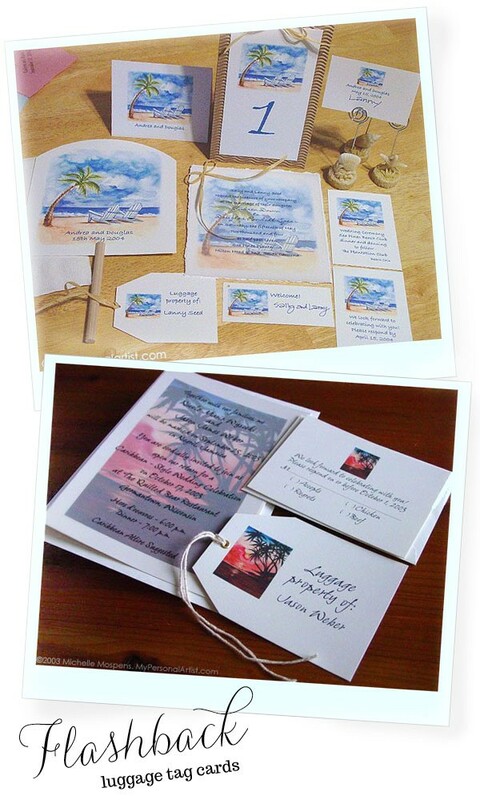 Below, you will find Florida Key Islands place cards that were tied on to favors for guests. Awesomeness!